"I'm looking to buy a 2000 Bullet Deluxe 500 Military... any thoughts?" "2000 was a good year; there were improvements made mid-way through 1999. The advantage to the Military is that if there's a flaw or rust you can repaint it easily. Real military motorcycles weren't showpieces. Some owners complained that the metal pannier boxes rattled and were not well made. If that is a problem you can always replace them with canvas rucksacks typical of real military bikes of World War II vintage." Buying a used Royal Enfield motorcycle is a bit different. For one thing, you probably don't have a dealership close by and, if you did, it may not have a used motorcycle in stock. If you buy used, you may have to buy from a private owner and that means "as is," and "where is." No warranty. 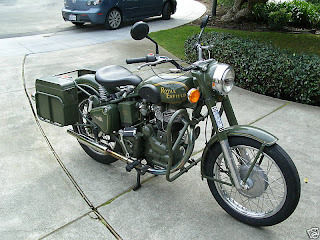 Furthermore, just about everything on a Royal Enfield can be fixed or replaced. There is no such thing as plastic side covers they don't make anymore. That is one advantage of a design that has changed so little over the decades. Even items that are rare (some switchgear from some years) can be replaced by aftermarket goods. So, finding a Royal Enfield with a few counts against it may not rule it out if the asking price leaves room in the budget for some parts and repairs. Obviously, you will want to avoid major engine or transmission work, out-of-round wheels and damaged wiring looms. 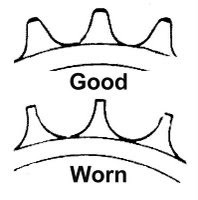 If the motorcycle runs well, rides well and makes no disturbing noises, you may have done all you can to protect yourself from these sorts of unseen problems. 1. Noise. My main bearing went bad at 40,000 miles. The noise it made was not loud, but it was distinctive and the key was this: the knocking came when I let OFF the throttle. 2. Sprockets. Look carefully for wear. My rear sprocket wore out at 30,000 miles. You can't see the front sprocket but take my word for it, it will need changing at the same time and it is a far more difficult and, thus, more expensive a job. If you see wear, ask for a reduction in the selling price. 3. Cables. They are not terribly expensive to replace but they do have the potential to strand you immediately. If you detect a weak clutch cable (I could when I bought mine), gently ask the owner if he has a new spare cable to throw in. Finally, consider why someone sells a Royal Enfield. In many cases it will be because they thought they were buying a motorcycle that could cruise with their faster friends. Ask as innocently as you can "how fast can she go?" If the owner claims to have held 75 on the expressway you may be looking at an abused motorcycle -- or a liar! A Royal Enfield that has been cared for and well sorted out by a previous owner could in fact be a better machine than it was when it left the factory. Items like better after-market mirrors, conversion to right-side shift, sprung seats, 18-tooth front sprockets and retro-fitted exhaust systems are often made by the first owner. They improve the Bullet greatly. By buying used, you may pick these things up at a fraction of their cost and none of the trouble to install them.